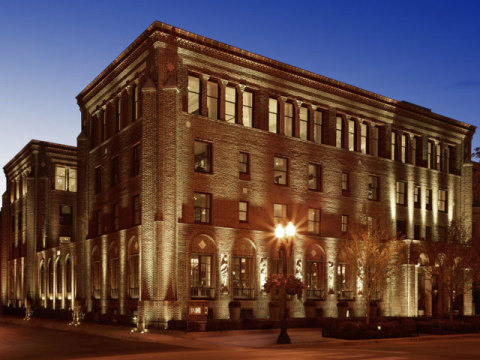 CORTE MADERA, Calif.--(BUSINESS WIRE)--Oct. 7, 2015-- RH (Restoration Hardware Holdings, Inc.—NYSE:RH) announced today the opening of RH Chicago, The Gallery at the Three Arts Club at 1300 North Dearborn Parkway on Chicago’s famed Gold Coast. This first-of-its-kind retail concept signifies the brand’s initial foray into hospitality with a seamlessly integrated culinary offering by celebrated restaurateur Brendan Sodikoff, which includes the 3 Arts Club Café, the 3 Arts Club Wine Vault & Tasting Room, and the 3 Arts Club Pantry & Espresso Bar. Guests can enjoy an ingredient-driven menu of breakfast, lunch and dinner in the central garden courtyard sitting under the heritage olive trees and listening to the sound of trickling water from the restored historic fountain, appreciate a glass of wine from the curated list in the dramatic Wine Vault & Tasting Room, or grab their favorite coffee drink and a daily selection of Doughnut Vault donuts or pastries from the 3 Arts Club Pantry & Espresso Bar. The Gallery also features the first in-store presentation of RH’s newest business concepts, RH Modern and RH TEEN. Reclaimed, restored and reimagined, RH Chicago spans nearly 70,000 total square feet across six floors, unveiling a glass-and-steel-enclosed Grand Courtyard, a Rooftop Park & Conservatory and a Lounge with Historic Performance Stage, marking one of the most significant architectural undertakings of its kind. Mr. Friedman continued, "I could not be more excited and honored to be collaborating with Brendan and his team on this first-of-its-kind project. I found Brendan's experience, working with chefs Alain Ducasse in Paris and Thomas Keller at The French Laundry in Yountville, and his vision to infuse the care and concern for cooking that exists at those famed establishments into the foods that we eat everyday inspiring." Mr. Friedman concluded, "Being recognized for creating the best cheeseburger in America at Au Cheval by Bon Appétit and the Food Network, and also the best donut for consecutive years at Doughnut Vault, is no small feat." Brendan Sodikoff, Founder, Chef & CEO of Hogsalt Hospitality, added, "Rarely a project comes along that I feel an instant connection to. The team, location, history of the building and architecture captivated me." Mr. Sodikoff continued, "On my first walk-through of the space I could imagine myself dining under the glass atrium, a garden sanctuary tucked away in Chicago’s Gold Coast." RH Chicago marks Friedman’s continued collaboration with design architect James Gillam of Backen, Gillam & Kroeger, a firm recognized as one of Architectural Digest’s Top 100 Architect and Design firms in the world. The landmark was designed in 1914 by distinguished architectural firm Holabird & Roche and was inaugurated as a residence for young women studying music, drama and the visual arts. Honoring its cultural significance and singular place in Chicago’s urban landscape, the entire structure has been restored with great respect for its original vision in collaboration with the Commission on Chicago Landmarks, and now brought back to life with dramatic artistic abstractions and never-before-seen collections of luxury home furnishings in a gallery setting. Upon arrival, guests will be met by the newly restored exterior and main, tripartite entrance on North Dearborn Parkway – a series of three arches reaching 19 feet separated by fluted columns with Byzantine capitals featuring emblems of the three arts: music, drama and the visual arts. To the south, the building features sculptural reliefs of female figures, which are replicas of the Jean Goujon panels at the Fontaine des Innocents in Paris. A rhythmic series of towering Bosque Elm trees, sculptural boxwood hedges and geometric topiaries in beautiful steel planters – all atop a canvas of decomposed granite – punctuate the base of the façade and provide a striking evergreen landscape. As night falls, the building’s architectural details and gardens are illuminated in a warm, painterly glow. Visitors will then pass through a vestibule complete with barrel-vaulted ceiling and into the entrance hall, where they will find “The Source,” a rare 19th-century, seven-foot statue of cast iron – whose origins trace back to Limoux, France – by acclaimed sculptor and medalist Louis Sauvageau. Here, they will also discover the grand stair – reopened years after having been walled off to reveal natural light emanating from the Rooftop Conservatory five floors above. Looking ahead, visitors will enjoy unobstructed views through the Lounge with its historic stage lined with gilded antique mirrors to create an endless reflection and further illuminate acoustic performances by musical artists. On the main level, guests will experience the historic courtyard, which for the first time in the building’s history is functional year round with the addition of a new pyramidal glass and steel structure, creating a conservatory inside the building that soars to 20 feet at its apex. Suspended from this center point directly above the Courtyard’s circular – and newly restored – 12-foot historic fountain is a stunning eight-foot rococo crystal and iron chandelier. From the Courtyard’s perimeter, visitors will be able to pass freely through 8 reopened archways that lead to each room on the main level, including the historic living room with its reclaimed fireplaces and the loggia with its iridescent gold, groin-vaulted ceilings and original herringbone brick floors, which now plays host to the 3 Arts Club Wine Vault & Tasting Room. Along the way, visitors will enjoy artistic installations of luxury home furnishings from renowned designers and global artisans in a setting enhanced by the Club’s intricate mosaics, decorative tile work and striking frescoes – all of which have been restored to their original glory. The Grand Courtyard will also be the central location for the Gallery’s hospitality experience, conceptualized in partnership with restaurateur Brendan Sodikoff. A natural extension of the Gallery, the 3 Arts Club Café will offer a curated menu of seasonal, ingredient-driven fare in a welcoming and relaxed space where guests will feel truly at home. The Courtyard will showcase towering Heritage olive trees set within colossal steel planters, exposed brick walls lush with star jasmine, geometric topiaries and second-floor window boxes brimming with flowers in an elegant palette of greens and whites – an all-season oasis filled with fresh air and natural light. A selection of fine coffees, teas, pastries and donuts from Sodikoff’s famed Doughnut Vault can be found in the nearby 3 Arts Club Pantry & Espresso Bar. On the second level, visitors will discover the RH Design Atelier – a dedicated 3,000-square-foot studio anchored by a custom 30-foot table for interior designers, architects and guests to conceptualize highly personalized, inspiring spaces. The Design Atelier will include RH’s vast library of fabrics, leathers and furniture finishes, as well as the latest technology and capabilities to support an unprecedented level of design services. Also featured will be an exclusive Ben Soleimani rug showroom displaying the fourth-generation designer’s hand-knotted and hand-woven rugs and other specialized galleries for window treatments, bed and bath linens and bath hardware. The third level will feature the first physical expression of RH TEEN as well as a RH Baby & Child gallery. Here, guests will find tasteful, high-quality furnishings for children and young adults that are distinctive in their own right, but blend seamlessly with the rest of the home. Level four is an 11,000-square-foot exhibition space featuring the first in-gallery presentation of RH Modern, the largest curated and fully-integrated assortment of modern furnishings, lighting and décor under one brand in the world. Developed in collaboration with revered global designers, RH Modern represents a fresh and innovative point of view defined by a minimalist aesthetic and maximum comfort. RH Contemporary Art – which has been integrated into RH Modern – will also be showcased with original works from a globally curated roster of artists. At the top of the grand stair, guests will arrive at the new Rooftop Park & Conservatory. Here, they will discover a one-of-a-kind destination featuring banana palms, sculptural evergreens and exotic succulents, as well as a second RH Design Atelier for outdoor living. Open-air pavilions with billowing shade canopies, glimmering chandeliers, giant pyramidal topiaries, boxwood hedges, trickling fountains and panoramic views of old Chicago will showcase intimate vignettes of RH Outdoor furnishings. RH Chicago, The Gallery at the Three Arts Club offers complimentary valet parking and a house car. The phone is 312.475.9116. Hours of operation are Monday through Saturday from 10am to 7pm, and Sunday 11am until 6pm. This release contains forward-looking statements within the meaning of the federal securities laws including statements related to presentation and layout of The Gallery at the Historic Three Arts Club in Chicago including the customer experience and the Company’s merchandise and business offerings within this location, the breadth of the merchandise collection in the RH Modern assortment and the operation of hospitality within the Company’s business. You can identify forward-looking statements by the fact that they do not relate strictly to historical or current facts. We cannot assure you that future developments affecting us will be those that we have anticipated. Important risks and uncertainties that could cause actual results to differ materially from our expectations include, among others, risks related to the number of new business initiatives we are undertaking; our ability to introduce new products and merchandise categories that will be of interest to our customers and to new customers; as well as those risks and uncertainties disclosed under the sections entitled “Risk Factors” and “Management’s Discussion and Analysis of Financial Condition and Results of Operations” in Restoration Hardware Holdings’ Form 10-K filed with the Securities and Exchange Commission on March 27, 2015, and similar disclosures in subsequent reports filed with the SEC, which are available on our investor relations website at ir.restorationhardware.com and on the SEC website at www.sec.gov. Any forward-looking statement made by us in this press release speaks only as of the date on which we make it. We undertake no obligation to publicly update any forward-looking statement, whether as a result of new information, future developments or otherwise, except as may be required by any applicable securities laws.